"My first truck was a 1998 Peterbilt 377. It cost me $15,000. It was a faded burgundy color, but the paint on the roof was so badly faded that I had to use Rust-Oleum high gloss black paint and apply it with a roller. I buffed out the paint myself. The whole truck was such a mess, I just started at the bottom and worked my way up. I cleaned it up as well as I could and was using it to transport cars within a month. If the truck had been in good shape when I bought it, it would have gone for $125,000. I kept it for a year and then sold it to purchase a 2013 Peterbilt 389. 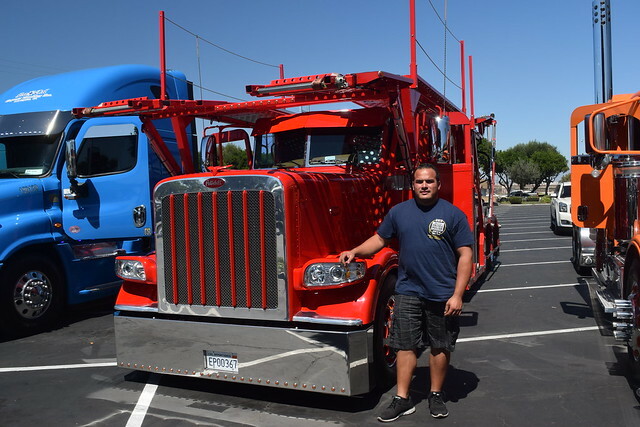 "Eventually I sold that one and then bought this stock Peterbilt, which I have modified to look like it does today. I think it helps me to get more jobs. It's like going in for an interview in a coat and tie instead of shorts and a T-shirt. My truck and the pride I take in its upkeep impress potential clients. "My dad was a truck driver and he put a lot of pride in his work. Often, he would take me out on runs. We would go from Long Beach to Phoenix, up to Las Vegas, and then back home. He let me clean his truck and work on it to make it look and feel better. I was make to drive a truck."